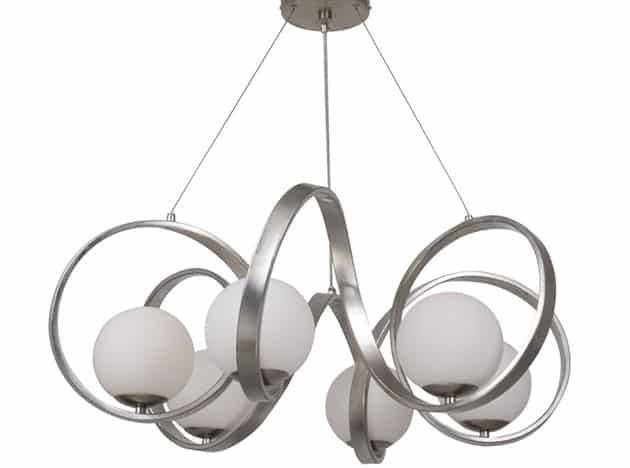 A beautiful modern globe chandelier can transform a room and give it style and elegance. Below we explore some of the best globe chandeliers to give your interior designs an impressive look you’ll love. 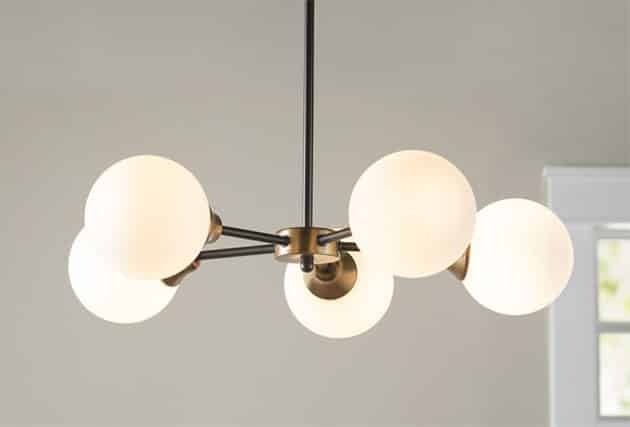 What is a Modern Globe Chandelier? The types of modern chandeliers that we’ll be showcasing today are modern globe chandeliers. As the name implies, globe chandeliers come in spherical shapes as opposed to the typical circular or axial shapes of more traditional chandeliers. With the advent of current technologies, the materials used to create globe chandeliers can vary from copper to wood and from glass to steel. Styles also range from more traditional aesthetics to more contemporary, rustic industrial types. The possibilities truly are endless. Chandeliers date back to the 14th century and have come a long way since then. Back then, it was purely utilitarian; it took on the simple form of two connected wooden beams nailed together at the center. It formed a cross where candles can be fixed to the ends. You hang that to light up your dark medieval nights and you have a 14th century chandelier or chandelle, French for “candle holder”. Around 500 years after that, gas started to become a standard for lighting. People invented the gasoliers, although obviously that name didn’t stick. Due to the flexibility and ease of use of gas lighting, gasoliers had more imaginative and compelling designs than the older chandeliers. After that, we come to our modern use of electricity and the possibilities for chandelier designs became even more limitless. 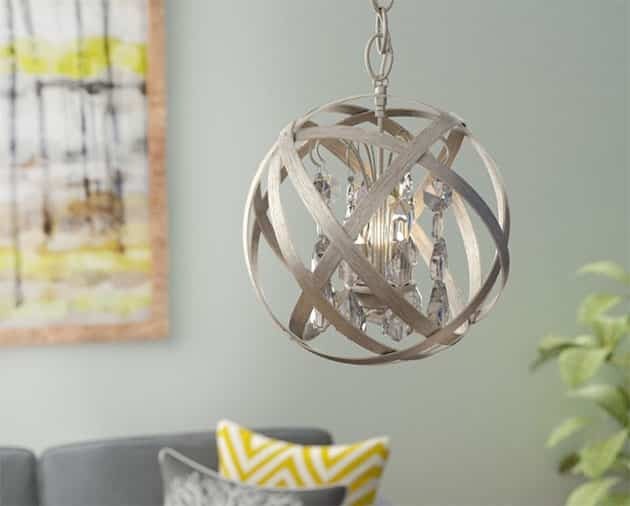 At present, utility has become somewhat of a secondary function of these hanging lighting fixtures, and much emphasis has been put into the style and aesthetic of them more than anything else. They’ve become a status symbol or design focal point of sorts. In contrast to longer modern chandelier shapes, globe chandeliers create a more focused, central design point and source of light. As such, they serve to define the center of a space and create a visual focal point for most designed rooms. 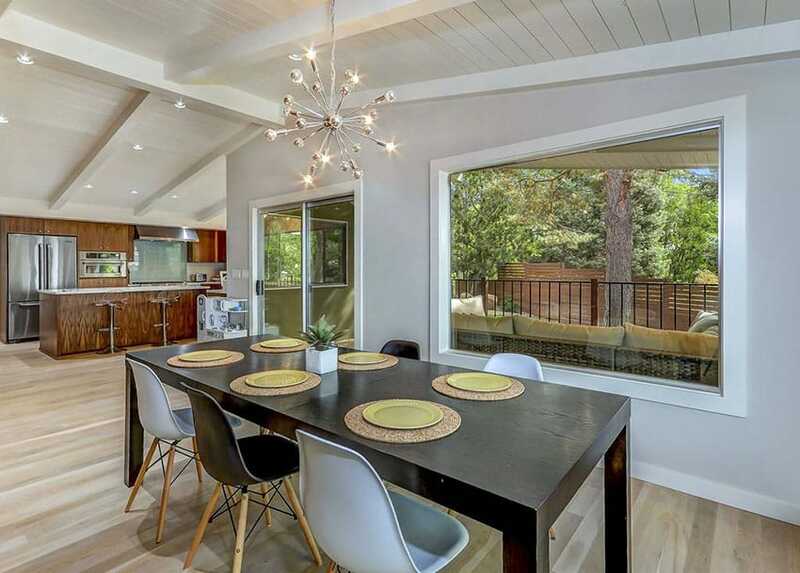 Some pendant lighting and hanging fixtures are spread across longer spans. We have modern linear chandelier types or individual hanging pendant lights spread across vertical spaces. Although useful for certain uses, they tend to have a lesser impact design-wise, since the attention of the design is spread across a longer length. Globe chandeliers are more focused and are better at creating visually striking design points in the room. Traditional chandeliers that are round or circular in shape are also good at creative these types of accents but aren’t as contemporary or striking as a three-dimensional orb shape. Dining Rooms: Dining rooms are great places to set up globe chandeliers. This is especially true for dining rooms with circular dining table setups. Globe chandeliers are great for defining which part of the room is the central design focal point. As such, keep the layout in mind when deciding where to put the chandelier. See more dining room lighting ideas here. Reception Rooms: Any large open halls are made several times for aesthetically striking when a globe chandelier is thrown into the mix. Reception rooms and gathering halls with open layouts need a visual center to keep the space from looking too plain or monotonous. Interesting room lighting, especially well-designed and stylish chandeliers, can do the job perfectly well. Bathrooms: If you have a little more to spare in your budget, large master bathrooms would do incredibly well with globe chandeliers decorating their ceilings. Chandeliers are great sources of light and some good visual acuity is essential when grooming yourself in the bathroom. Not to mention the added style points that a bathroom pendant light fixture can add to the room. Take a look at our gallery of bathroom chandeliers for more ideas. Living Rooms: One can often find living room chandeliers positioned in the center of the space above the primary seating area. They work well for high ceiling rooms to fill the space and provide visual interest between the ceiling and living space. When used with soft candle bulbs they can effectively illuminate art work or soften shadows with great results. Kitchens: Cooking spaces are sometimes the least of a homeowner’s worries when designing their humble abode. 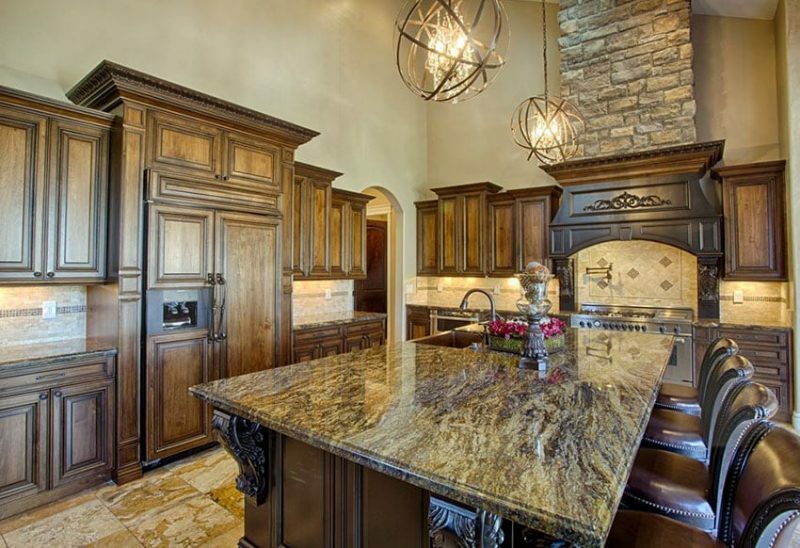 However, try not to scrimp on the interior design of the kitchen. Modern day lifestyles have made that previously purely utilitarian space into a convening area of sorts. How many times have you spent the better part of your day just hanging out at the breakfast bar? As such, bold design elements are a good supplement to the room. Globe chandeliers can help in that regard. 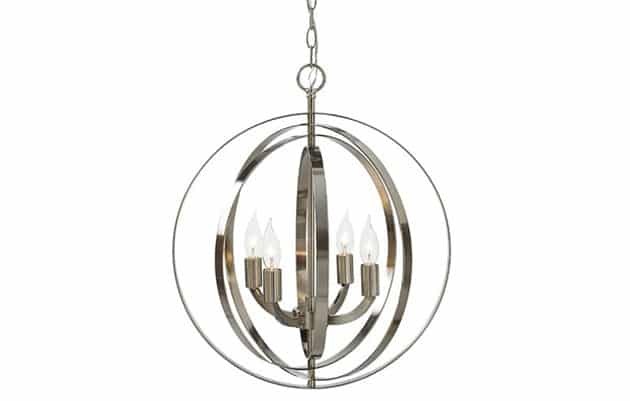 Description: This contemporary, cosmopolitan globe pendant lighting has a subtle yet bold allure that can only be achieved with this particular globe chandelier design. Sophisticated and subtly striking, this chandelier’s aesthetic is best used for dining table setups and patterned area rugs. Description: The almost atomic-esque design of the bent round wrought iron rings encircle a bundle of six fluorescent lights. The cherry on top (or rather, the bottom) is the glass droplet decor that hangs from the bottom of the chandelier. This black iron beauty is perfect for entrance foyers or dining rooms. Description: Sputnik chandeliers are always a joy to behold. This globe sputnik chandelier has five adequately large globe bulbs supported by subtly minimalist rustic black rods with bronze accents. This design element is a perfect visual statement for living rooms or reading halls at home. Description: Glam has always been a popularly luxurious design style when it comes to interior home designs. 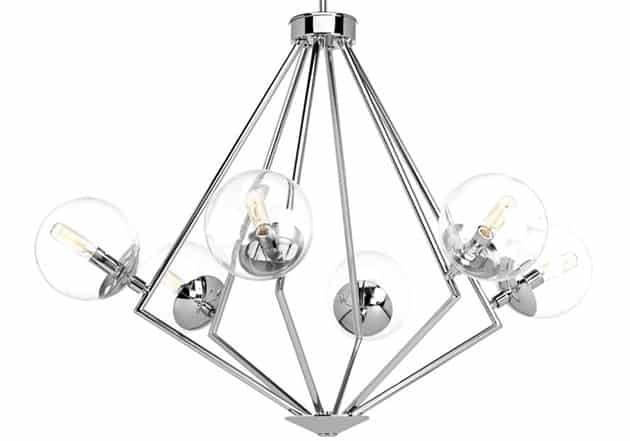 This three-light pendant globe chandelier has a unique and striking design that is sure to become a conversation piece at your next dinner party. 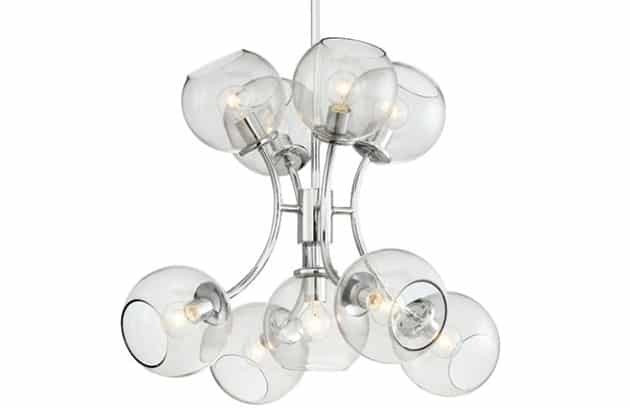 Use this chandelier in social spaces around your house such as your formal dining rooms or your formal kitchens. Description: Aged and rustic designs are always perfect for that homey yet endearingly stylish bold look that most homeowners and designers like going for. 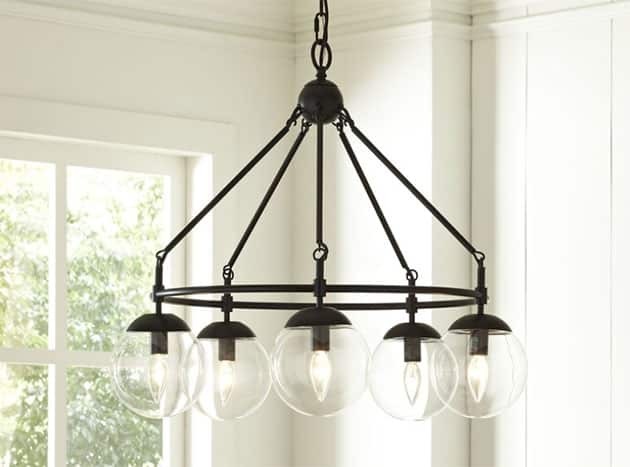 The clear glass globes give you some good amount of light and the aged bronze and black metal finishes make the chandelier look classy yet subtle. 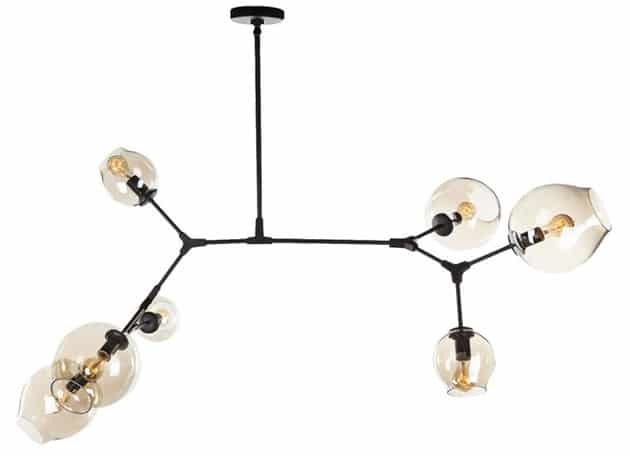 This chandelier design is perfect for communal lounge spaces such as reading rooms, living room, or family rooms. Description: Hand blown glass has a certain charm about it that not many other types of light bulbs can replicate. Couple that with this unique geometric branching pattern and you have yourself a very stunningly interesting eclectic piece of decor. Use this for living rooms or dining rooms to act as a design focal point. Description: For more cabin aesthetic or industrial style interiors, jute-wrapped and any other yarn-based design work is a perfect supplement. They are eye-catching, homey, and endearingly stylish. These work well mainly for dining rooms but you could choose to place it in your master bedroom spaces as well. Description: Strikingly bold, this luminaire features nine light bulbs and arching chrome support rods. This is perfect adornment for any contemporary and modern space. It’s sure to be an eye-catching conversation starter for any space. 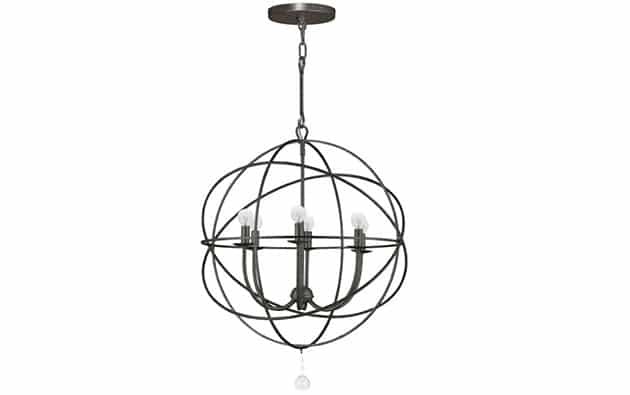 This type of globe chandelier is perfect for living rooms or formal dining spaces for guests to appreciate. Description: This eye-catching piece of art is a perfectly flexible globe chandelier that’s suitable for a variety of spaces. Its interesting design and stylish finishes makes for a high-end, classy look. Its flexible design makes it suitable for a large array of rooms, kitchens, entrance foyers, dining rooms, and living rooms among them. Description: With a neo-futuristic design and a stunning polished chrome finish, this globe chandelier is a perfect example of great lighting. Its upward turned light bulbs result in an indirect lighting cast on the room below to reduce glare. Its stylish aesthetic is a perfect addition to any home. 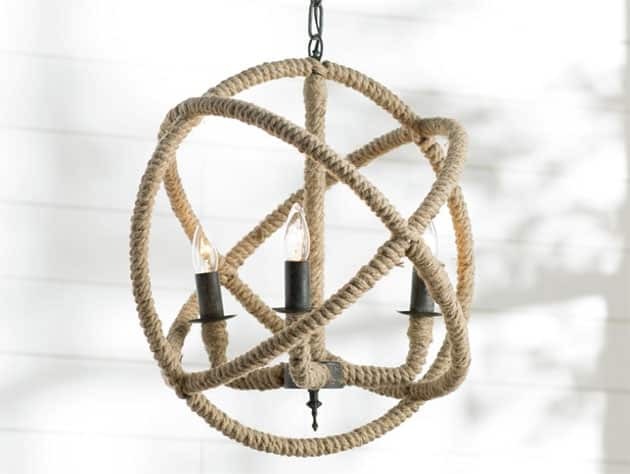 It would be a an attractive choice to place this chandelier in dining rooms, master bedrooms, or living rooms. Visit this page to see modern linear chandeliers for your next home remodel project.